DID SALON EDUCATION JUST CHANGE FOREVER? If you would like to learn how to save 72% or more on your advanced salon training then this page will show you how. So Why Hasn't Salon Education? When you were graduating beauty school you got a pat on the back as they wished you good luck and walked you out the door, with out really teaching you how to actually make a living as a hair stylist. It was ALL up to you to go out and learn it on your own. And that meant traveling to expensive classes to learn the latest techniques, the ones that you NEED to be successful. It meant struggling to find clients, and there were probably those days you went home after a long day questioning if you had made the right career choice. But mostly it meant trying to do it all yourself, from keep up with the vortex of new styles and techniques your clients demand all by yourself (thank you very much Instagram) to building your clientel, to keeping up with the ever changing world of social media. It was all on you. NOW THERE IS A BETTER WAY!! Style Artists Academy is a monthly membership where you get one brand new class on the 1st of every month…but instead of paying hundreds of dollars for it, you get it for MUCH MUCH less. Style Artists Academy does the same thing, but instead of getting a box of random stuff that costs you money, you'll get top tier advanced salon training that is going to MAKE YOU MONEY behind the chair. Get one brand new, High quality, full length course added to your account on the 1st of every month. Courses that people typically pay $250-$500 to attend live. Each month we host a live “Ask The Expert” event with the month’s Featured Educator. Watch the class, try the technique, and then be able to ask your questions…once you have had a chance to actually try the technique and know your real questions. Growth comes from knowledge. Grow your knowledge faster with 12 high-value lessons each year for the same price you used to pay for just 1-2 classes. Learn right from home, whenever you can fit in your monthly lesson. Imagine! You’ll never again have to spend one of your days off at a class, or spend money traveling, or take time away from husting and working to advance your career. "I signed up during a free webinar, and I'm glad I did! I really like that I can login in at anytime and watch the videos whenever it’s convenient. 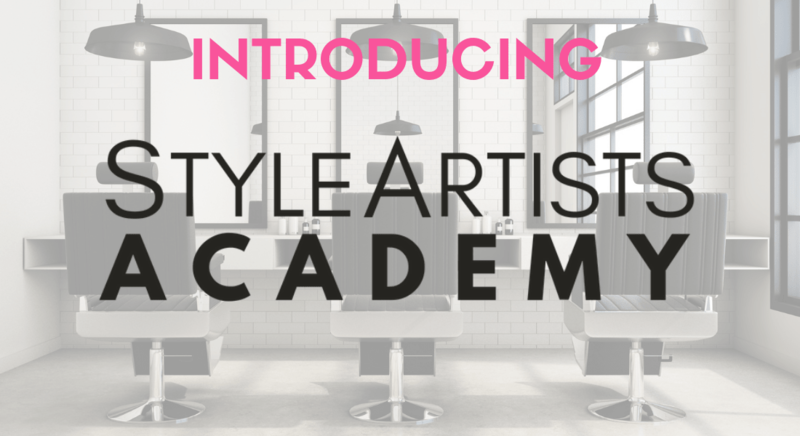 I have already benefited from these courses and I look forward to seeing more of my favorite stylists on Style Artists Academy." "I love how Style Artists delivers quality information so we can change our lives behind the chair. After my first course I began offering modern balayages to my guests PLUS I’m getting appointment requests on Instagram which never happened before. So I would say it was a total success." "After my first class with Style Artists Academy I was able to feel confidence and knew that the techniques and tools I’d learned would tremendously pay off in the end. My clients are blown away and were so happy with the results. " Always be up to date with the latest trends and techniques by signing up for the annual plan. Get 12 classes for about the same price as most people charge for one class. * All sales are final, You are free to cancel your membership at anytime, but we do not offer refunds. Once I become a member, do I get free access to past lessons? No. Members can purchase previous trainings at the same price other members paid for them. It doesn't seem fair to get something for free, when everyone else had to pay for them. Is it true that you blacklist people who cancel their subscriptions? -Yes, but there are excptions. We regularly black list members who take advantage of the system by joining and canceling when it's convenient for them, cherry picking a course here and there. The truth is, it costs us a lot to create one of these courses, and we depend on our loyal members to keep the great information flowing. What it boils down to is that we have decided to work only with Members who truly value what we are doing... You shouldn't have to put up with clients who take advantage of you, and neither should we. Will I be missing something I’d get at live classes? The only thing you’ll miss is spending 3+ hours in a hard chair practicing your contortionist skills trying to see around the 20 other students who arrived at the class before you did. Can I cancel or change my membership? Yes, you can change between monthly and annual pricing any time. And you can cancel your subscription any time, you will keep access to all the courses you have already paid for, but won't receive any new couses once your current plan expires. Are there advantages to taking your online lessons over taking live lessons? Have time to try techniques and ask questions when you join us for our Live Ask The Artist Panels. Of course, you also save time and money on travel. Why does this cost so much less than live classes, what am I missing? Beleive it or not most educators don't make very much money. Travel expenses and marketing the class eats up most of the profits... We eliminate those costs for the Artist allowing us to provide the same indept content for a much lower cost to you. Is the quality of your online classes as good as live classes? Yes, the quality is every bit as good. In fact, we think they are even better. Never feel you don't totally understand the technique, rewind, re-watch, and revisit your courses as many times as you want.